Click HERE for your video lesson! Humanist scholars of the Renaissance were influenced by classical ideas. So, too, were architects and engineers. Renaissance architects studied Greek and Roman ruins. They modeled their own buildings on what they learned. They were particularly attracted to rounded arches, straight columns, and domed roofs. Renaissance Architecture and Engineering Renaissance architects also added their own ideas to classical building styles. During the Renaissance, wealthy families built private townhouses known as palazzi (pahl-AH-tzee), which is Italian for “palaces.” Many had shops on the ground floor and homes above. Most palazzi were built around a private courtyard, which might contain statues or other works of art. Public spaces were often influenced by humanist ideals. For example, humanists valued good citizenship. Architects designed public buildings with outdoor plazas where citizens could gather in settings that were grand, yet welcoming. Innovations in engineering made new kinds of architecture possible. One of the most impressive architectural feats of the Renaissance is Santa Maria del Fiore, the great cathedral in Florence. Florentines started building this eight-sided cathedral in 1296, but they had to leave an opening for the dome. At the time, they didn’t know how to build a sufficiently large dome that would not collapse. It took a Renaissance architect, Filippo Brunelleschi (feel-EE-poh broon-el-ES-key), to solve the problem. 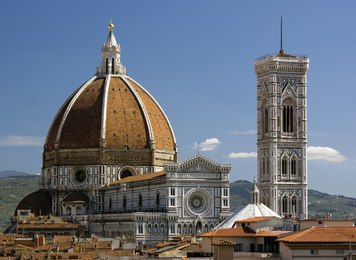 Building Florence’s Dome Brunelleschi had studied ancient ruins in Rome. He had also learned about the mathematics involved in constructing buildings. The dome he designed for the cathedral took true engineering genius. It used no internal support beams or columns. Instead, eight huge stone arches met at the top of the dome and leaned against each other. Hoops of iron, wood, and brick wrapped around the arches, keeping them in place. The magnificent dome was finished in 1436. It rose more than three hundred feet above the city. Santa Maria del Fiore, also known as the Duomo, still stands today, more than five hundred years later. From its top you can see most of the city of Florence.